So as a dealer, what should you know about these “green” cabinets before offering them to your customers? Why do so many manufacturers give up millions long-term kitchen sales to get thousands short-term? Over the years, we’ve worked with hundreds of dealers. 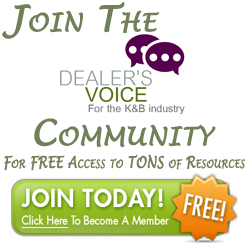 We find it interesting to track the reasons why dealers switch lines. It’s not a comprehensive study by any stretch of the imagination, but it is very telling. In this industry, Manufacturer reps have historically been solely focused on selling their product line. I dated this girl once and I was so into her I couldn’t even see straight. Kind of reminds me of the cabinet industry. It’s a funny thing really, having your manufacturer offer financial incentives directly to your salesreps so they will sell their products. Here’s the cold, hard fact: kitchen & bath dealers often feel they get very little value from their manufacturer’s rep.